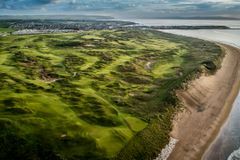 The wild sand dunes of the County Antrim coastline set the scene for the Portrush golf tour, whose star attraction is the only course outside the United Kingdom to have hosted the Open Championship; the majestic Royal Portrush. Consistenly ranked as one of the world's top 20 courses, Royal Portrush is a phenomenal golfing experience; ruthless and untamed, this is links golf in its most essential form. The ultimate Portrush tour will encompass the area's most impressive golf courses, which are almost as incredible as the star turn itself. Of particular recommendation are Castlerock and Portstewart, which typify the rugged and enchanting character of this golfing paradise on the Northern Irish coastline. To plan your perfect tour speak to our dedicated Northern Ireland specialists.